With the summer months fast approaching, hopefully more people will be able to get out and enjoy the great outdoors. 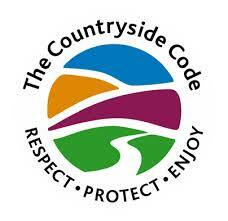 Here is a copy of the countryside code to help keep people visiting, land owners, visiting dogs and livestock safe on their walks. 1. Respect the people whose lives and livelihoods depend on the countryside ie. don’t park across gateways or footpaths. 2. When riding a bike or driving a vehicle, slow down or stop for horses, walkers and farm animals. They have right of way over cyclists on bridleways. 3. Co-operate with farmers working in the countryside. 4. Go Green! If possible leave your car at home and use public transport or a bike to visit the countryside. 5. Leave gates and property as you find them. 6. Keep to the marked footpaths. Let the local authority know if you think a sign has been placed illegally. 7. Don’t touch livestock or farm machinery. 8. Use gates or stiles rather than climbing over walls etc incase you cause damage to them. 9. Do not disturb the birds, rocks, plants, trees or pick wild flowers. 10. Take all litter and leftover food home. 11. Do not start fires. 12. Keep dogs under control at all times especially around livestock and horses. Some local authorities ban dogs from certain areas and also restrict the number of dogs walked by one person at any one time so check with the local authority of the place that you are visiting first. 13. Remember to bin or take home any dog mess from your dog. 14. Ensure you check the weather forecast and your route so help prevent any problems whilst out walking. This entry was posted in Uncategorized on March 23, 2016 by james@friendsforpets.co.uk.